As many of you have heard, Grindline Skatepark’s founder Mark Hubbard passed away last week. Without a doubt is influence, love and dedication to skateboarding will continue to be felt and shared by generations of skateboarders for years to come. Have a look at our Focal Point section which sheds some light on Monk’s beginnings, his life of pain and passion while sharing the joy of skateboarding. The Cult of Concrete mini doc delivers the truth of his visionary talents and pushing it forward. In honor of Monk’s lifework and legacy, Grindline Skateparks has asked skaters and friends worldwide to gather at their local skateparks on Friday, June 22nd to skate and remember his contributions to skateboarding. Rest in Peace Mark Hubbard. The story of Mark “Monk” Hubbard, and his history as the leader of the visionary outfit Grindline Skateparks. This past summer I was invited to get together with a collective group of hard working skateboarders, lensmen, artists, webmasters and media types for a first-hand visit to the historical Pine Ridge Reservation in South Dakota. Through Levi’s Skateboarding, our primary purpose in this visit to the Oglala Lakota Native American reservation was to join several of Levi’s Skateboarding ambassadors including Marius Syvanen, Josh Matthews, Joey Pepper, and Pat Moran for the grand opening ceremony and celebration of a new skatepark in the small town of Manderson, not far from the historical site of the Wounded Knee Massacre which took place on December 29, 1890. This was the second skatepark constructed on weather-beaten Pine Ridge Reservation and it was aimed directly at providing the Lakota Oglala youth another creative hub to gain confidence, share physical activity and to nurture self-esteem. Located at the southern edge of Badlands National Park, The Pine Ridge Reservation is an underprivileged region with a storied and tough to swallow past. Its terrain is arid and crusty, well worn and time tested. Past the geographic roughness of this expansive territory, the daily life of Lakota Oglala people can be very heavy and the greater community on the res is among the poorest in the nation. Alcohol possession and consumption has been illegal on the reservation for decades, yet just over the border to the south in Whiteclay, Nebraska there are four liquor stores situated along the two lane interstate route to a population of just a dozen people. These liquor outlets sold over 4.9 million 12-ounce cans of beer in 2010 almost exclusively to Oglala Lakota from the reservation for gross sales of 3 million dollars. What’s even more alarming is that suicides rates among teens and young adults have surged in the past twelve months on the reservation. Since December of last year to March of 2015, at least 103 people ages 12 to 24 have attempted to kill themselves with nine of them succeeding in their wish to end their lives. The poverty, tough living conditions, drug abuse and alcoholism on the res can be a very grim deterent of a better life upon the remote and windswept grasslands. Thankfully, on the much brighter side, the Lakota youth have Oglala Sioux Tribe member and veteran skateboarder Walt Pourier doing a tremendous job through his Stronghold Society organization to share messages of hope and inspiration to help give these kids and young people a fair chance at a long and healthy life. Assisted by former pro skateboarder Jim Murphy and their youth mentors, much of this work is conveyed through the freedom and positive power of skateboarding. Since its inception, it’s turning the outlook on life for these teens from dismal to hopeful to optimistic. Grindline Skateparks constructed the first concrete skatepark at Pine Ridge in 2012 upon a rough 6,000 square foot patch of dirt littered with broken bottles. Its development came through in kind donations and support from Jeff Ament and Pearl Jam’s Vitalogy Foundation, Vans and The Tony Hawk Foundation. And since its opening, the Four Directions Toby Eagle Memorial Skatepark has become a significant fixture in the community and a hub where teens get together to share creativity and physical activity away from pressures at home, influence of gangs and other adverse effects of daily life on the res. Prior to the initial Pine Ridge build, there were less than a dozen skateboarders throughout the community. Two years later, there are now over one hundred. Our visit to Pine Ridge also included the opportunity to attend the colorful festivities of the 30th Annual Oglala Lakota Nation Pow Wow at the fairgrounds adjacent to the skatepark. Native American families gathered from across the country in decorative dress and entertained traditional dances among all generations in attendance. Afterwards, we hung out and skated the Pine Ridge skatepark including its newly completed section with a smaller banks, hips and a handrail. Jim Murphy, Joey Pepper, Josh Matthews, Pat Moran and Marius Syvanen shared the stoke with the locals, signed autographs and put on a great impromptu skate demo until an abrupt and blustery hailstorm enveloped the region and soaked everyone gathered below. Our skating was done for the day and it was soon time to make our way back home. The gallery of photos below exhibits several of the images that I captured during our two-day visit to the reservation. To utter the words, “skateboarding saves lives” is quite cliché, but it’s so very true and profound amongst the Lakota Youth of Pine Ridge. We experienced it first hand and saw the positive power that it yields for these kids. The Northern entrance of the Pine Ridge Reservation along Highway 27. Todd Bratrud voluntarily planks himself during our visit to Badlands National Park. Bombing hills on skateboards through Badlands National Park is a big no no. We got off without fines due to our upcoming visit with the Lakota Skate Club of Pine Ridge. (Left to right) Jeff Ament, Jim Murphy, Oglala Sioux Tribal President John Yellow Bird Steele, Walt Pourier and Erik Wolsky gather for a great cause at the Manderson skatepark opening. Oglala Lakota kids line up for complimentary completes provided to them by Jim Murphy and Wounded Knee Skateboards. Oglala Sioux Tribal President John Yellow Bird Steele instructs the youth of Manderson to take care of the gift that has been provided to them for years to come. Jim Murphy takes the time to abuse his trucks with a frontside carve at Manderson’s new bowl. Members of Lakota Skate Club tune up their newly donated gear at the Manderson Skatepark. After nearly 24 hours of travel from Copenhagen, Marius Syvanen takes flight above a newly constructed quarterpipe in Manderson as Greg Hunt captures the action. Marius Syvanen signs his name towards a great cause in Manderson. A Lakota girl takes a break to watch the action during opening day at the Manderson skatepark. Jeff Ament takes charge of the coping with a powerful backside carve at the Manderson skatepark opening. The dynamic duo of Jeff Ament and Walt Pourier – these two guys are doing great things for humanity. Pat Moran gets ready to land a kickflip out of this frontside blunt as the Lakota youth take notice. This large group portrait gives rise to the Manderson skatepark opening ceremony. It was a very special day for the youth of the Pine Ridge Reservation. Horseback is just another part of res life in Pine Ridge. Two friends of Pine Ridge share a moment during the 30th annual Oglala Lakota Nation Pow Wow. Jim Murphy takes blocks on this lengthy rock and roll boardslide through the corner of Pine Ridge’s Four Directions Toby Eagle Memorial Skatepark. Portrait of David White bull Jr. in Pine Ridge. David White bull Jr. slices through a feeble transfer at the Four Directions Toby Eagle Memorial Skatepark in Pine Ridge. Walt Pourier and Matt Sharkey pair up for a great message and good times at the Four Directions Toby Eagle Memorial Skatepark in Pine Ridge. Josh Matthews floats high above a newly shaped small hip at the Four Directions Toby Eagle Memorial Skatepark in Pine Ridge. Soon after Marius Syvanen nailed this backside kickflip over the hip, the cloud behind the trees delivered a fierce hailstorm and we were soaked, but stoked. Taking cover from the wetness with boards and smiles in Pine Ridge. Be sure to check out The Good Problem’s take of our visit to the Pine Ridge Reservation with additional info, photos and video clips as well . Zach Baker’s account from our Pine Ridge visit has been posted to the Monster Children site as well. Many thanks go out to Levi’s Skateboarding, Walt Pourier, Jeff Ament, Jim Murphy, Grindline Skateparks, Erik Wolsky, Matt Sharkey, Marius Syvanen, Josh Matthews, Joey Pepper, Pat Moran, David Pajo, Cat Power and Greg Hunt for their great work and kinds hearts to unify their efforts to make life better for those that otherwise might not have the chance. Without question, skateboarding saves lives! When you have a belief and a passion towards something that moves you and comes from the heart, you pursue it. Such is the case and creative aspirations of Mark “Monk” Hubbard, and his skatepark company Grindline Skateparks which began from humble beginnings in the Pacific Northwest. Tune in to this short film that follows Mark’s story and his huge contributions amongst several others, which helped to kickstart the modern day public skatepark movement. 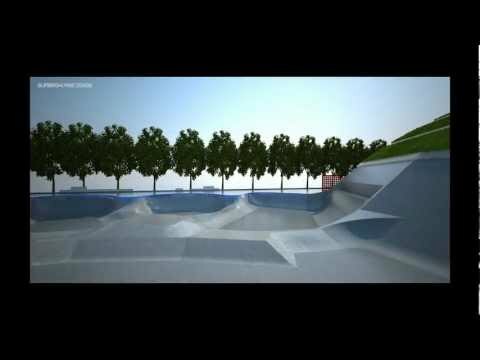 Perhaps you’ve already heard of it or maybe not, but the large scale indoor/outdoor skatepark better known as the StreetDome complex in Haderslev, Denmark is well on its way to being completed later this summer. Designed by with the help of Rune Glifberg, the crew at Grindline has spent the past months shaping and pouring the hybrid street and bowl elements which will feature some of the best skateable concrete in Northern Europe.